“From reluctant jihadist to crusading lawyer, the life of Shahid Azmi was a remarkable one. Gunned down while defending accused Mumbai bomber Fahim Ansari, Azmi was transformed into an unlikely martyr. But Hansal Mehta’s new film is much more than a biopic; Shahid captures the zeitgeist of a generation. – Cameron Bailey, Artistic Director, Toronto International Film Festival. Consider this : By the time he was gunned down, Shahid Azmi had at least 17 acquittals to his credit, a great benchmark for the small span of time he was an advocate. So why am I writing about this film? Or rather, why am I compelled to write about the experience of this film? Because the film is as close to a real tale as I have seen. The real story of the film concluded with Shahid’s death but just 2 years ago. His strife is still fresh in our minds. It is a Mumbai tale that Mumbaites know. Difficult to satisfy a critical Mumbaite filmmaker’s mind with a Mumbai story. Their mannerisms and expressions are palpable, the interactions are humanly common stance, and the scenes make me angry, make me cry, make my blood rush through my temples, and sometimes make me smile, even squirm with discomfort. Hansal’s approach to acting as well as most things in the film has been organic in nature, and bereft of conventional method. Many scenes, even dialogues have often been reworked on location. It is a dangerous terrain for a Director to operate because an actor can easily bend a scene in a fashion that could alter the earlier intent. Hansal chose a difficult route to extract from artists what they felt was the most honest delivery. 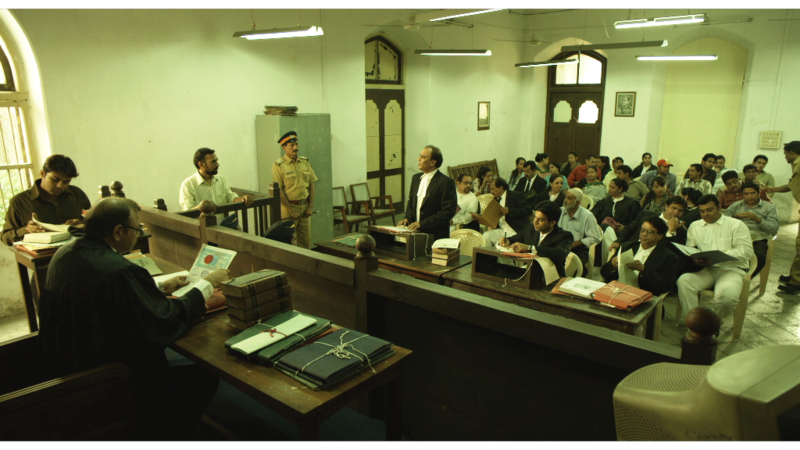 So in the court scene, when the judge too becomes argumentative with the advocates and the accused, the theatre split into laughter, or when the naked Shahid is tortured in the Lodhi Police Station Cell, the viewer in the next seat clenched his fists. There are other reasons too why this impact is astounding. The Cell is lit by a single tube, and does not light up the protagonist in agony. 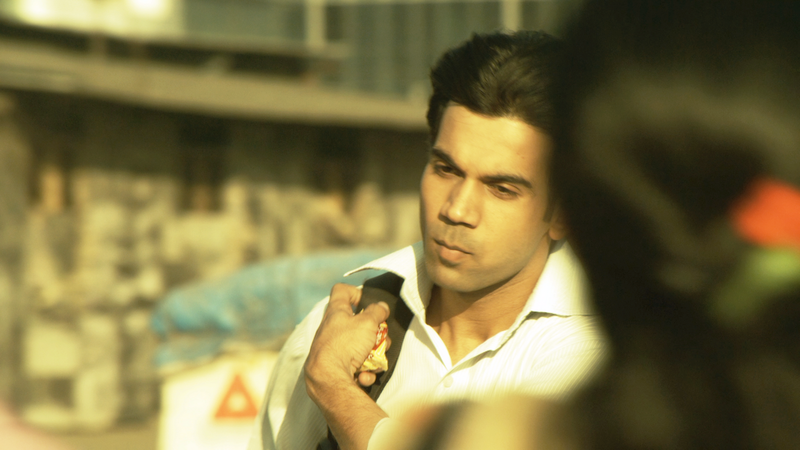 Consider this: The DOP (Anuj Dhawan) saw the location (A friend’s godown in Andheri) and said, “Perfect! Lets shoot!” And Hansal as a Director had the balls to do exactly that. Hence the spaces become volumes that the viewer can relate to and inhabit. Consider this: Shahid’s house in the film is Shahid’s own house, and Shahid’s office in the film where he was shot dead, is in actuality Shahid’s office. A year after his murder, when they were shooting in her house, Shahid’s real mother asked to meet the actor. She just wanted to see him…for her, Shahid was still a part of her ‘present continuous’. 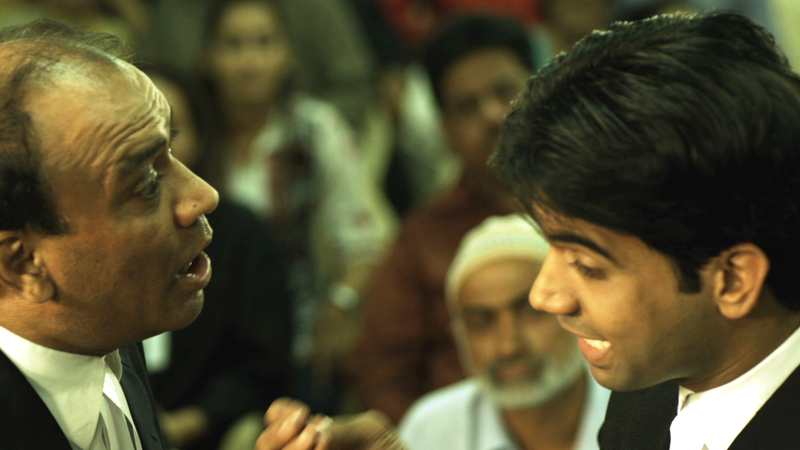 Her other son, Khalid Azmi (Played by Vaibhav) has gone on record to say that the film is 95% close to the real story. So Hansal’s choices, or democratically speaking the crew’s and the cast’s choices were nakedly honest. Hansal was able to guide them through to keep the story of Shahid alive and true. It is one thing to say, fine, I do not care that the actor’s face is not lit up in a scene, and yet another to accept that different digital cameras will land on the shoot on a regular basis. Consider this: They get a RED MX camera one day, a Red One on another and the next day an Alexa. On some days all they had was a Canon 5D. Hansal and his DOP (Anuj Dhawan) have the guts and gumption to mount it and shoot, to make the most of the time available with the given location and the cast on roll call. What a nightmare for the DI artist and the post-production technical crew. It looks like a film about the Muslims, for the Muslims, by the Muslims. However, there is not a single crewmember except the artist Arif and the Professor (Played by Mohd. Zeeshan Ayyub and Yusuf Husain respectively) who are muslims. Not the protagonist, neither the director, nor any of the artists, nor even the writers. 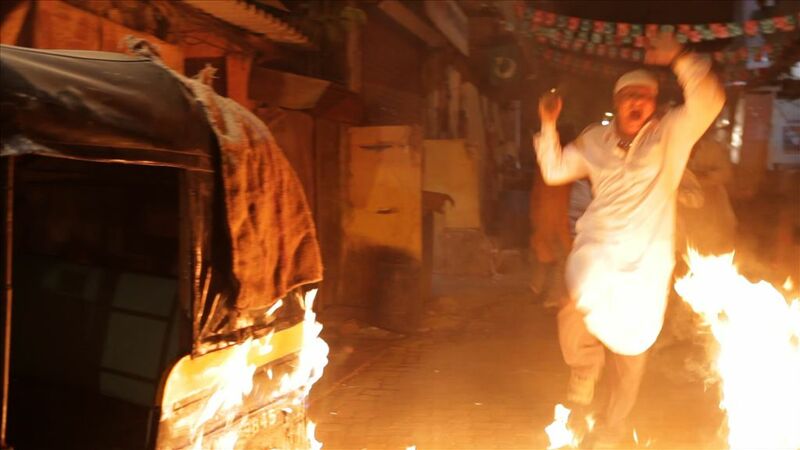 And the film is about the plight of the Muslims in India. Or perhaps anywhere and everywhere in the world. Simple folk who are pious, righteous, and who wean through the hard struggle of life. Muslims who are wronged for the only reason – that they are Muslims. And yet, the story could be of any community, as one never becomes conscious of the ‘religion’ in the story but is sensitized only to the situation and the events. Go see any other film about the Muslim community made with adequate or handsome funds and compare – which is the more engaging, which is more honest, which is the tougher film to make, which is bringing a truer story for the audience’s appetite in today’s time of the RTI, which has more layers, which sets you thinking, which churns your bowels, which makes you feel guilty, helpless, angry, which is the one not biased, which is the one that makes you more aware, more empowered, which is the one non-exploitative? So there is no definite genre that the story can be pinned by. It is neither a courtroom dram, although the crucial scenes are set in courts, neither is it a romantic tragedy, although Shahid’s supportive wife leaves him and then he dies, nor is it a martyr heroic film, although Shahid ends his life as a martyr for a cause. In fact, it is all this and more, because Hansal does not steer it to a dramatic fictional tale but insists steadfastly to narrate the story of an individual with all the truisms intact. Consider this: Shahid was supposed to be a well-funded film by a corporate production house with a star in place. Hansal and Sunil Bohra (Producer) chose the other route lest the shenanigans of the star system or the numbers game shackle them. And they embraced the hardship with a tougher stance of honesty to make a moving, compassionate film. For any Director to touch and mould his material with a humanitarian approach is one of the most difficult directing tasks. Hansal has not just immersed himself with the material but internalized it, forgotten his leanings, left aside the grammar of filmmaking that he learnt through his earlier seven feature films, as well as rid himself of easy shooting or post production solutions. Consider this: The editor Apurva Asrani also co-wrote the film. The earlier decision was to make a non-linear narrative as the world over, the traditional linear narrative is considered to be passé and not smart enough for today’s times. Apu is also known for drastic usage of NGs (No-good takes), jump cutting, and edgy editing styles. With the material in front of them, they both opted to be dumb but true to the material and formed a linear narrative! Apu’s edit does not leap out of the screen at you but lets you immerse yourself in the development of the story unhindered. Consider this: A veteran artist has reservations because her role seems to be just 3 pages in the courtroom. So she decides nearly 8 hours before the shoot to decline. She has doubted the director because he has said that we will improvise the scene and the dialogues as we shoot. But that is the organic way that Hansal wanted to make the film by involving everyone concerned with the scenes. Consider this: When the village in the hills threw up extras that were Hindus, the lead actor Raj Kumar Yadav had to train them stepwise (12 steps) on how to do Namaaz. The Director read numbers in order to get shots with movements in cohesion from the group. The sound recordist had but just one assistant for the schedule. That is brave for a film with live sound (Sound Recordist: Mandar Kulkarni). Although the temptation to turn voyeuristic is huge, Hansal’s camera does not try to barge close to the man who is in flames in the riot filled streets of 1993 Mumbai to sensationalize it, nor does it travel from sunset silhouettes to a frontal of the twosome’s faces up North in POK as they share a happy repartee moment, nor does it underline the most significant moment of Shahid’s assassination in the office with a close up or a long shot. 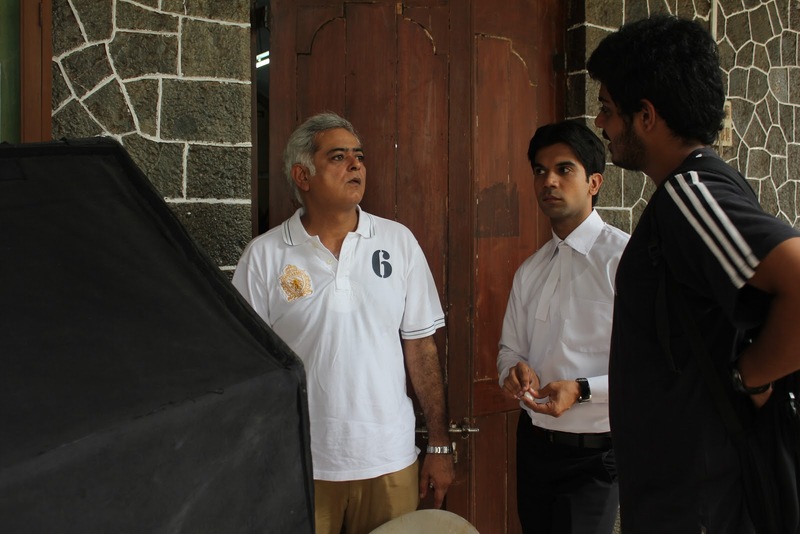 Hansal and the DOP refrain from the usual temptations of over dramatizing the situation. The screenplay (Sameer Gautam Singh and Apurva Asrani), the Mise en scène, the acting, and the editing too blends the subtle manner of telling, aided by a music track that does not interfere with the realism. During the depiction of the love story, the dialogues are as matter of fact as can be, and so are the situations. Hansal’s ingenious shot division helps us see to events in a seamless fashion. This Spartan style of filmmaking lends way to a new language that is close to real life, and not the crafted, arranged carefully kind of a story, spoon fed by loud, crass everything-to-be-said-through-dialogue and underlined by music. The proximity to the material increases manifold and the viewer relates to the unfolding of the story in a much more integral, much more organic manner. No wonder that audiences in Canada (At the Toronto Film Festival) and at the MAMI waited in long ques due to ‘word of mouth’ to see the film. And no wonder that Hansal has had standing ovations at both places. Hansal’s directorial abilities were never questioned, and infact lauded several times (Dil Pe Mat le Yaar, Chhal, Jayate, etc.) Nor were his sensibilities (it was his own decision to stay away in ‘Wanvas’ at Lonawala for so many years). 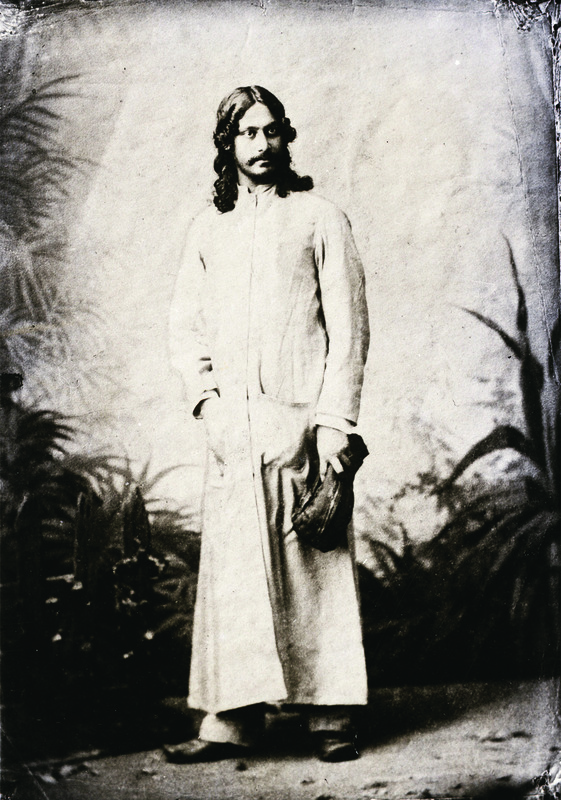 He meandered just about everywhere in the Mumbai Bollywood terrain of storytelling. This film has cemented his road. Hansal has to start walking on this path which will lead him to greater heights and us as viewers to greater experiences that he will invoke as a refined old-wine director. I just hope that the film sees the light of the day and does not but just roam the festivals of discerning viewers across the globe. And hoping against hope that the authorities and political parties do not intervene with their typical horse blinds on release or before. Consider this: Hansal and Sunil Bohra (Producer) have refrained from censoring the film and releasing it because they want audiences to see the film in this form; the more the better – wonder what will transpire at the censor board. It is a significant film of our times about our times. There, I have said it. 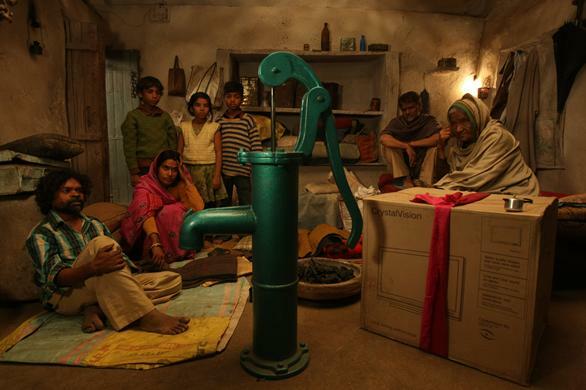 Produced by Aamir Khan and directed by debutant Anusha Rizvi, Peepli Live has been selected for the Sundance Film Festival. The film will compete with 13 other films in the World Cinema Dramatic Competition. Total 1022 international narrative features were submitted for this category. And this one is real big! Not the fake olive leaves that everyone loves to put on their poster for every gulli-nukkad festival and keep on counting the numbers. Some even boast of 30-40 festival rounds, except, ofcourse the top five. Its been ages since an indian feature made it to the competition section of any top rated international film festival. 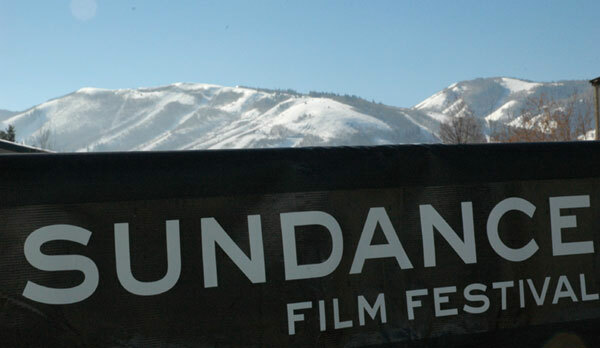 And Sundance is rated among the top five film festivals. And here is the one the Screen published…. Peepli Live, is not just a take on farmer suicide but also on media’s obsession with ‘breaking news’ and publicity-hungry politicians. While Raghuvir Yadav plays the role of a farmer who announces his suicide days in advance, Nawaz (last seen in New York) essays the role of an aspiring hotshot reporter who decides to go town with Yadav’s announcement. His news catches the attention of news channels and politicians, which in turn results in Yadav’s character failing to commit suicide. The story’s irony lies in the fact that Nawaz’s character, which unknowingly acts as a catalyst in saving the farmer’s life, kills himself after he finds himself disagreeing with the ethical standards being practised by certain sections of the media. Interestingly, while shooting across homes, fields and roads at Badwai village near Bhopal, the unit managed to keep reporters, shutterbugs as well as locals at bay. The details of other 13 films are as follows…. “All That I Love” (Poland) – Directed and written by Jacek Borcuch, about four small-town teenagers who form a punk rock band in 1981 during the growth of the Solidarity movement. With Mateusz Kosciukiewicz, Jakub Gierszal, Mateusz Banasiuk, Olga Frycz, Igor Obloza. North American premiere. “Animal Kingdom” (Australia) – Directed and written by David Michod, which centers upon a 17-year-old boy who, in the wake of his mother’s death, is thrust precariously between a criminal family and a detectives who hopes to save him. Stars Guy Pearce, Ben Mendelsohn, Joel Edgerton, Luke Ford, Jacki Weaver, James Frecheville. World premiere. “Boy” (New Zealand) – Directed and written by Taika Waititi, a study of how two young brothers reconciles fantasy with reality when their father returns home after many years. Features Waititi, James Rolleston, Te Aho Eketone. World premiere. “Four Lions” (U.K.) – Directed by Chris Morris, written by Morris, Jesse Armstrong and Sam Bain, a comedy about some self-styled British jihadis. With Chris Wilson, Kevin Eldon. World premiere. “Grown Up Movie Star” (Canada) – Directed and written by Adriana Maggs, which spins on a teenage girl left to care for her rural father when her mother runs away. Features Shawn Doyle, Tatiana Maslany, Jonny Harris, Mark O’Brien, Andy Jones, Julia Kennedy. U.S. premiere. “The Man Next Door” (Argentina), written and directed by Mariano Cohn and Gaston Duprat, about two neighbors who clash over a wall separating their properties. With Rafael Spregelburd, Daniel Araoz, Eugenia Alonso, Ines Budassi, Lorenza Acuna. International premiere. “Me Too” (Spain) – Directed by Alvaro Pastor and Antonio Naharro, about the unconventional relationship between a 34-year-old college-educated man with Down syndrome and his free-spirited co-worker. With Pablo Pineda, Lola Duenas, Antonio Naharro, Isabel Garcia Lorca, Pedro Alvarez Ossorio. International premiere. “Nuummioq” (Greenland) – Directed by Otto Rosing and Torben Bech, written by Bech, a contemporary story of how a young man pieces together aspects of his past and gets on with his life while journeying through Greenland’s imposing landscapes. Stars Lars Rosing, Angunnguaq Larsen, Julie Berthelsen, Morten Rose, Makka Kleist, Mariu Olsen. World premiere. “Son of Babylon” (Iraq) – Directed and written by Mohamed Al Daradji, the tale of a young Kurdish boy and his grandmother as they travel through Iraq searching for the remains of their father/son in the wake of Saddam Hussein’s fall from power. With Yasser Talib, Shazda Hussein, Bashir Al-Majid. International premiere. “Southern District” (Bolivia) – Directed and written by Juan Carlos Valdivia, a look at social change that envelopes an upper-class family in La Paz, Bolivia. Toplines Ninon del Castillo, Pascual Loayza, Nicolas Fernandez, Juan Pablo Koria, Mariana Vargas. North American premiere. “The Temptation of St. Tony” (Estonia) – Directed and written by Veiko Ounpuu, which centers upon a mid-level manager with an aversion to being “good” who confronts life mysteries as he loses his grasp on his once-quiet life. Features Taavi Eelmaa, Rain Tolk, Tiina Tauraite, Katarina Lauk, Raivo E. Tamm. World premiere. “Undertow” (Colombia-France-Germany-Peru) – Directed and written by Javier Fuentes-Leon, an offbeat ghost story in which a married fisherman on the Peruvian seaside tries to reconcile his devotion to his male lover within the town’s rigid traditions. Stars Cristian Mercado, Manolo Cardona, Tatiana Astengo. North American premiere. “Vegetarian” (South Korea) – Directed and written by Lim Woo-seong, about a housewife whose strange dreams and resulting meat aversion cause trouble with her husband and attract the interest of her artist brother-in-law. Toplines Chea Min-seo, Kim Hyun-sung, Kim Yeo-jin, Kim Young-jae. International premiere.